Today is the first Sunday in Advent. Christmas is coming. My ideal Christmas would probably involved sending and receiving Christmas cards - because despite the bad press they get, I think they are a lovely way to show gratitude for the year past, express hope for the year to come and remind people of the joy it is to celebrate the birth of our precious Lord and Saviour Jesus Christ - and then on Christmas day, go to church and catch up with the family for a cup of tea and a mince pie or two. Of course it isn't that straight forward. There are lots of extras. And in amongst all the extras I find it all too easy to take my eye off the ball. I lose my focus on Jesus. 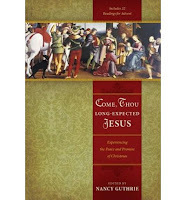 So this year, while our boys are reading through the first 24 or 25 chapters of The Jesus Story Book for their Advent calendar readings, I am looking forward to reading my way through Come Thou Long Expected Jesus - a book of 22 readings focussing on the events of the Christmas story, mostly excerpts from longer pieces penned by the greats of old (Saint Augustine, Martin Luther, John Calvin and Charles Spurgeon) through to the modern greats (John Piper, Time Keller and JI Packer) and lots in between. The list of writers is impressive and the chapters are short. Perfect! I came upon this little book from the good reviews it received here, here and here and have had it tucked away in my bookshelf for most of the year, waiting for December to arrive. I am looking forward to catching a few minutes every day for a chapter of this book with a cup of tea, praying that it will help me to keep my eye on the ball and give Right perspective to the unusual amount of activity that this time of year seems to generate. And I hope it lives up to expectation because I have given away about eight copies during the year for birthday presents - so quite a number of my friends will be reading along too. But for now, I'm off to church and after that I'd better go and dig out the boys' Advent calendar and get that ready for the 1st December! The Lord’s people are emphatically a weary people. It is a “weary land” through which they are passing- it is no marvel that they should be faint, even though pursuing. Here is the cause of the greatest weariness. Not more truly does the “whole creation groan and travail in pain,” than does he who “bears about with him the body of sin and of death, day by day.” It is indeed to him a continual and unrelievable pressure. “Who will deliver me from the body of sin and of death?” is his constant and mournful cry. It is the union of the opposites in him that creates his burden. Life and death- holiness and sin- grace and nature- are in perpetual, and often fierce combat. In this lies the inward conflict. This is the fight of faith. Until life was breathed, and holiness was created, and grace was given, there were no oppressions, and no warfare, and no weariness. Think of this, you burdened and oppressed saints of God! Let this thought fall like a sunbeam upon your gloomy and saddened spirit. Let it cheer you in your cloudy and dark day. On the tenth day of the fifth month, in the nineteenth year of Nebuchadnezzar king of Babylon, Nebuzaradan commander of the imperial guard, who served the king of Babylon, came to Jerusalem. He set fire to the temple of the LORD, the royal palace and all the houses of Jerusalem. Every important building he burned down. The whole Babylonian army, under the commander of the imperial guard, broke down all the walls around Jerusalem. Nebuzaradan the commander of the guard carried into exile some of the poorest people and those who remained in the city, along with the rest of the craftsmen and those who had deserted to the king of Babylon. But Nebuzaradan left behind the rest of the poorest people of the land to work the vineyards and fields. The Babylonians broke up the bronze pillars, the movable stands and the bronze Sea that were at the temple of the LORD and they carried all the bronze to Babylon. They also took away the pots, shovels, wick trimmers, sprinkling bowls, dishes and all the bronze articles used in the temple service. The commander of the imperial guard took away the basins, censers, sprinkling bowls, pots, lampstands, dishes and bowls used for drink offerings—all that were made of pure gold or silver. The bronze from the two pillars, the Sea and the twelve bronze bulls under it, and the movable stands, which King Solomon had made for the temple of the LORD, was more than could be weighed. Each pillar was eighteen cubits high and twelve cubits in circumference; each was four fingers thick, and hollow. The bronze capital on top of one pillar was five cubits high and was decorated with a network and pomegranates of bronze all around. The other pillar, with its pomegranates, was similar. There were ninety-six pomegranates on the sides; the total number of pomegranates above the surrounding network was a hundred. The commander of the guard took as prisoners Seraiah the chief priest, Zephaniah the priest next in rank and the three doorkeepers. Of those still in the city, he took the officer in charge of the fighting men, and seven royal advisers. He also took the secretary who was chief officer in charge of conscripting the people of the land, sixty of whom were found in the city. Nebuzaradan the commander took them all and brought them to the king of Babylon at Riblah. There at Riblah, in the land of Hamath, the king had them executed. This is well written history. It is plain and matter-of-fact. An objective description of what took place. And yet despite the plain style of writing, it's a deeply moving passage. Ever since the great rebuke, I have trained myself to read the detail in the harder bits of the Bible (a.k.a. some of those long, tedious descriptions) slowly and carefully and have come to love passages like the painstaking accounts of the construction of the Tabernacle in Exodus and the detailed buildng plans of the Temple in Kings and Chronicles. The beautiful and extraordinary detail in these plans is important because these were the places where God would dwell - these were physical spaces that needed to be fit for a King. And here in Jeremiah, described in very plain language, it is all plundered and destroyed. This week I have been reading Lamentations. If the end of Jeremiah was moving, Lamentations is raw grief. This is the more human description of the fall of Jerusalem - the eye witness account and the personal response, written in poetic form, probably by Jeremiah. There's horror, pain, sorrow, remorse, repentance, an acceptance of God's righteousness and right to judge and running wonderfully through chapter three, deep faith in God and hope in Him despite desperate circumstances. This is a really amazing section of Scripture. It describes an important moment in Biblical history but it also gives a stunning portrait of the human experience - of the hope we have if we choose Life (that can sustain us in our earthly life even under the most extreme of situations) and the consequences we face if turn our backs on Him. Now, speaking of John Piper and memorising Scripture, I have said before that I think memorising Scripture is important. Really important. But I don't do it. I have small spurts of enthusiasm for this task but they are short lived. I find memorising Scripture really difficult. For one thing I just plain have a bad memory - which would probably be improved for taking up this type of activity! And I am conscious of the fact that I don't pray before trying to memorise Scripture - and I expect Satan would quite like to see all of us defeated in this task. But the other reason I struggle - the reason I give up before I have even started - is that I don't retain a lot of what I memorise over the long term and this discourages me. At my best I had the aim of memorising two verses per week. For a while it is possible to memorise, review and retain a stash of verses. But it soon reaches a point where the number of verses to review becomes too great and then I give up. If I can't review them I won't be able to remember them. And if I can't remember them then there is no point in trying to memorise them in the first place. John Piper memorises Scripture every day during his quiet time. If that was only one verse per day, that would be 365 verses a year!! I don't. But practically, what can you do to keep it as long as you can? There is only one word. Review. Review, review, review. There is no way to memorize Scripture that keeps you from losing it. Some people don't lose anything. Some people have traps in their head that just hang on to it. But only 1 in 10,000 people can do that. Average folks like me have to work real hard to memorize the first time, and then recurrently review to keep it. So I memorize verses every day, and I forget them every day. This morning I re-memorized a verse. I finished Deuteronomy and ran across a verse that I memorized years ago. Maybe I memorize it once a year, because I read the whole Bible once every year. The verse is Deuteronomy 33:26. "There is none like God, O Jeshurun, who rides through the heavens to your help, and through the skies in his majesty." So, I've got it memorized. I probably will forget it in a week. That verse is hard for me to remember. I've memorized that verse probably five times in five years. I forget it because I don't use it as often as some verses. So, I jot it down on a little piece of paper and carry it in my pocket, pulling it out during the day once or twice. If I try to nail it so that it is useful for me over the long haul, I keep it and review it. A practical thing I would suggest for people to do, is decide what cluster of text they want to always be at their disposal. For me I could name Psalm 46, Psalm 23, Psalm 1, Romans 8, 2 Corinthians 5:21, a cluster of texts surrounding justification, 1 Peter 4:11—"let him who serves serve in the strength that God supplies, that in everything God may get the glory through Jesus Christ, to whom belongs the dominion forever." This is the most quoted verse as we move into worship at Bethlehem. So for my soul, for the warfare of my life, and for ministry in hospitals and counseling sessions, I want a cluster of texts at my disposal. Decide what those are, put them on a piece of paper, and review them until you have them down. I'll give you a little story. My first or second year of pastoring I was called to the hospital—quickly. I went without my Bible. Rollin Erickson's wife just had a heart attack. I walk into a room of probably 20 family members that didn't know if she was alive or dead—as she is in surgery. Rollin gave me a big hug and said, "John, give us a Word from the Lord." Now, if I had my Bible I would have opened it to a Psalm or something. I didn't have my Bible, and for whatever reason at age 35 my mind went blank. I felt so humiliated. It was horrible. Here are 20 people, and the husband of a dying woman says, "Give us a Word from the Lord." I can't even remember what I said. I probably said, "Let's pray," and tried to paraphrase some Scripture. I went home and got on my knees that afternoon. I said, "Lord Jesus, that will never happen again." I opened to Psalm 46—"God is our refuge and strength." I have been able to quote Psalm 46 verbatim for the last 28 years. I decided that Psalm 46 is going to be in my head because it is so useful all the time. The answer is, review. But don't try to do that with every verse you learn. You should be learning hundreds of Bible verses by heart, and forgetting 90% of them. But then you get to them again and relearn them, and they are still with you because you learned them once. Somehow they will function to get out into your life. But really nail down a cluster of soul strengthening words. That is a great comfort. Time to get back on the horse. I [do not] want to give the impression that I think there is virtue in reading many books. In fact one of my greatest complaints in seminary was that professors trained students in bad habits of superficial reading because they assigned too many books. I agree with Spurgeon: “A student will find that his mental constitution is more affected by one book thoroughly mastered than by twenty books which he has merely skimmed, lapping at them.” God save us from the allurement of “keeping up with Pastor Jones” by superficial skimming. Forget about “keeping up.” It only feeds pride and breeds spiritual barrenness. Instead devote yourself to boring in and going deep. There is so much soul-refreshing, heart-deepening, mind-enlarging truth to be had from great books! I actually think that for some people this point is not true. I know a few people who can devour a lot of material quickly and then process and retain what they read effectively. In fact I am married to one such person. But for me, Piper's quote rings true and is an encouragement. I read pretty slowly and I don't seem to be able to make a lot of time for reading in any case. So to choose a few really good books and read them slowly and carefully works for me.